Seems like illegally copied Chinese cars are much closer to the homeland than we thought. Porous as the United States’ borders may be, the fact remains that it’s still tough to get anything through that is not approved by US Customs and Border Patrol. If it was, Mexican drug cartels wouldn’t be as rich as they are and a good number of rare desirable cars would be roaming our streets having escaped the cruel injustice of the crusher that’s tasked with enforcing that 25-year import ban we all love to hate. However, in there’s a land south of our borders where that’s not the case and illegal cars can be imported freely. That includes blatant rip offs of the Jeep Wrangler, which is what a CarScoops reader seems to have found for sale in San Pedro Garza Garcia, Mexico. In China, where patent laws are as valued as a FoxConn worker’s life, automakers like BAIC get away with building models like the BJ40—what’s essentially a poorly disguised copy of the Jeep Wrangler—without being subjected to US patent laws. Though its squinted grille may have five slats instead of seven, the boxy shape, squared wheel arches, and removable black top and doors can be seen clearly, giving no enthusiast a reason to assume it was designed to mimic something other than a Jeep Wrangler. It’s no surprise that BAIC has found a way to get the BJ40 over the Great Wall and into another country’s dealership lots to turn a profit, which is why FCA and other automakers that have been copied aren’t keen on letting the process continue, but it’s slightly surprising to see an example for sale so close to the US border. FCA will be more pissed once it sees the the dealership is charging $531,900 Mexican pesos for it, which equals about $33,000 US dollars. 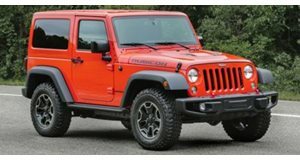 A quick price check shows that a base Wrangler can be had for $35,000 US dollars, only $1,000 more than the Mexican dealership is charging for the BAIC. Sorry FCA. The best we can hope for is a review where the BAIC BJ40 is compared against the real Wrangler. You know, for benchmarking purposes.